Whether you'll be dining in a European resort or simply wowing your friends stateside, this exquisite jacket is sure to impress. 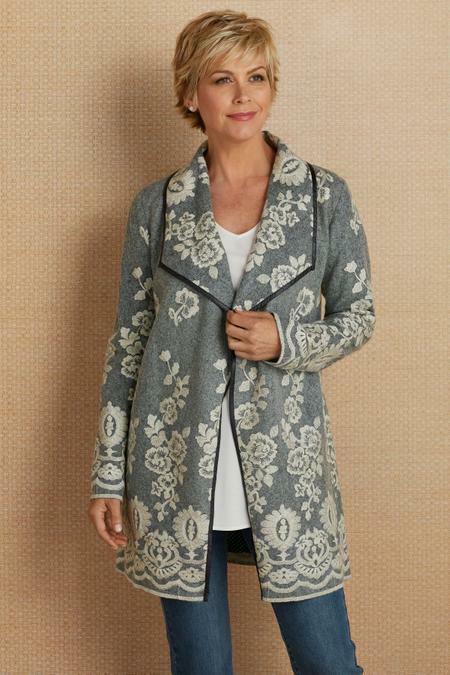 Lavishly embroidered in a rich, regal, floral and vine pattern, this beautiful long sleeve jacket has wanted details like lusciously-wide lapels, faux-leather trim, and a contrasting lining that features a delicate print on soft, black satin. Poly/acrylic/metallic/spandex. Misses 34"/36" long.